U.S. Olympic Equestrian rider Phillip Dutton jumps with Zeizos in West Grove, Pa., in this 2010 photo. Dozens of horses will fly from America to England for the 2012 Summer Olympics. "It's quite a logistical feat," Dutta tells Morning Edition co-host Steve Inskeep. Dutta, who has been moving horses around the world for some 25 years now, says his company will be flying from 50-60 horses to England. "Most horses, I anticipate, will be going from Newark airport in New Jersey to Stanstead, in England. We'll be flying on an MD-11, and the carrier, we expect, is going to be Federal Express." That's right: Dozens of valuable, highly trained horses will be FedExed from America to London. Many dressage and jumping horses weigh at least 1,100 pounds. Steve then asks a question that might occur to anyone who's paid to send a package recently: "Does FedEx charge you by the pound?" "FedEx charges us on a pivot-weight, yes. That's their model. It is usually by the kilo. And it's a volume weight charge," Dutta says. But if a cargo hold full of horses sounds a little harsh, consider that they'll also have a veterinarian, a groom, and others with them. And the equine athletes will be in custom-built stalls. "The horses are flown in jet stalls, which are proprietary stalls," Dutta says. "All of the horses that will be going to the Games will be flying two in a pallet, meaning they'll be sharing the container with another horse." That gives them more space, he says — the pallets can accommodate as many as three horses. As for an inflight beverage and snack service, the horses will get hay, along with apple juice mixed with water. They'll also get Gatorade, to help them stay hydrated, Dutta says, "and of course, carrots." His staff will use what Dutta calls "mood lighting" — dimming the lights to keep the horses serene. And if one does start to fret, "we'll have a groom stand with them and talk," Dutta says. The flight over the Atlantic Ocean will take just more than six hours. Still, Dutta says it's possible for horses to suffer jet lag. "We've done quite a lot of studies, especially in long fights. They are an animal of routine," he says, noting their tightly scheduled workouts and meals. 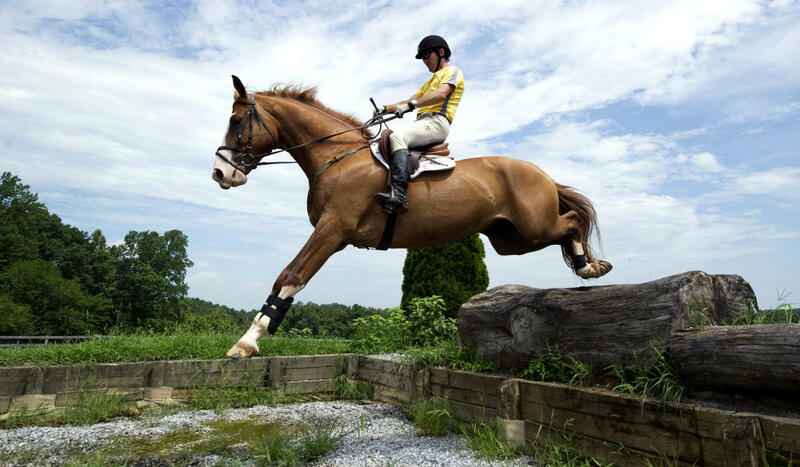 Dutta says that after long trips, horses' top performances usually come by using one of two strategies: flying just four days before the event, or arriving near the venue 14-21 days ahead of time, to let them establish a new routine. And he tells Steve that, like people, some horses are just better travelers than others. "Most horses that travel around the world are used to it. They are just like a frequent traveler at any airport; they know what is going on," Dutta says. "But even though they are superstars, we do have some horses that do not like to travel, that are worriers — that worry about the noise, or the sound, or the pressure." The horses remain standing during the flight, with two ropes helping to secure their halter. That's as close to a seatbelt as the equine athletes come. Still, Dutta says that during the flight, the pilots may decide to turn off the "fasten your ropes" light, so the horses can move about a bit more freely. The goal, he says, is to make the flight stress-free. The horse-cargo flights sometimes accept long delays, or alter course by 1,000 miles or more, to avoid potential turbulence in the air. And in some cases, a horse's vet may decide to administer a mild sedative — "which is equivalent to, say, a glass of Champagne or two," Dutta says. The horses' handlers do anything they can to get them to England healthy, and with low stress levels, so they're relaxed enough to perform well in their competitions. "We individually try to mix and match what each horse needs," Dutta says. "Because after all, this is the Olympic Games. And there is no dress rehearsal. We have one shot. And we are all about winning." Dutta spoke with Steve from Wellington, Fla., where the U.S. Equestrian Federation holds Olympic trials later this month. That event will help fill the U.S. roster of riders and horses for the games. But as Morning Edition reported Tuesday, a 70-year-old man has already won a spot on Japan's equestrian team. The largest competitors at this summer's Olympics in London are not weightlifters or shot-putters or basketball centers, big as they may be. The largest competitors are horses. In our countdown to the Olympics today, we're going to find out how these athletes travel to the games. That is the job of Tim Dutta who does this for a living. He's on the line from the stable in Wellington, Florida. Mr. Dutta, welcome to the program. TIM DUTTA: Thank you very much. Look forward to speaking to you. INSKEEP: Where are you exactly right now? DUTTA: We're in Wellington, Florida, which is about 15 miles inland from Palm Beach, at the indoor riding center watching some horses exercise. INSKEEP: So, how many horses do you need to transport from the United States or from across North America to London this summer? DUTTA: I would say we expect somewhere about 50 or 60 horses, but they'll be all going in different times. Plus, we have the Paralympics, so they'll be also sending their horses and para-riders. INSKEEP: I guess if you're transporting horses from the United States to London, you can't just load them in horse trailers. DUTTA: That's correct. Our company, the Dutta Corporation, give horses wings. This is what we do. We've been doing it for 25 years. Most horses, I anticipate, will be going from Newark Airport in New Jersey to Stanstead in England. We'll be flying them on an MD-11. And the carrier, we expect, is going to be Federal Express. DUTTA: Yeah, and this is an all-cargo airplane and we should have a team veterinarian and, of course, a professional groom accompanying these horses; coach classes - three in a box. And business class is two in a box, same service except the seats are much more comfortable. DUTTA: Or, in this case, the palette is much more comfortable. INSKEEP: ...you've basically got the equivalent of a row of stalls on board the plane. INSKEEP: Some hay down on the floor and everything? DUTTA: They will have hay. They'll have maybe apple juice just in case they don't want to drink enough, so we mix that with water. We do Gatorade just to make sure the hydration level goes, and of course carrots. INSKEEP: Two horses get jetlag? DUTTA: They do. They are animal of routine. They get fed at a certain time. They get exercise at a certain time. They wake-up at a certain time. They go to sleep. What we have seen is the best performance is either a short arrival, four days out of competition venue. Or we do a long-term staging, which is about 14 days to 21 days. So the horses, the grooms, the staff, the riders get used to the jetlag and get back into a routine. INSKEEP: There must have been horses over time that were extraordinarily skilled but they just didn't travel well. DUTTA: Absolutely, just like humans. Some people fall asleep just before takeoff on an airplane. And some people worry about and pray to God till they land. Most horses that travel around the world are used to it. But even though they are superstars, we do have some horses that do not like to travel, that our worriers. And we do all we can to make sure the stress level is little as possible. INSKEEP: Some people will, of course, take a drug of one kind or another when they're flying. Do some of the horses get drugged? DUTTA: It is the call of the team veterinarian. And if they need a mild sedative, which is equivalent to, say, a glass of champagne or two on the airplane, we certainly make sure that happens. DUTTA: And the job of us, on that call, is we want to get the horses there as safely and as relaxed as possible. We dim the lights inside the cabin of the airplane. The pilots are very skilled; they understand that we have very, very expensive precious horses on board. We sometimes reroute an airplane 15, 1,800 miles away just to beat the weather, so they don't have the trans-Atlantic bumps. We do leave no stone unturned to get these expensive animals there as safe as possible. INSKEEP: Tim Dutta is owner of the Dutta Corporation. He joined us from a stable in Wellington, Florida. DUTTA: Thanks, Steve, best to you. INSKEEP: Covering the world, it's MORNING EDITION from NPR News. You can follow us, by the way, on Facebook, Google Plus, and on Twitter. We're @morningedition and @nprinskeep.